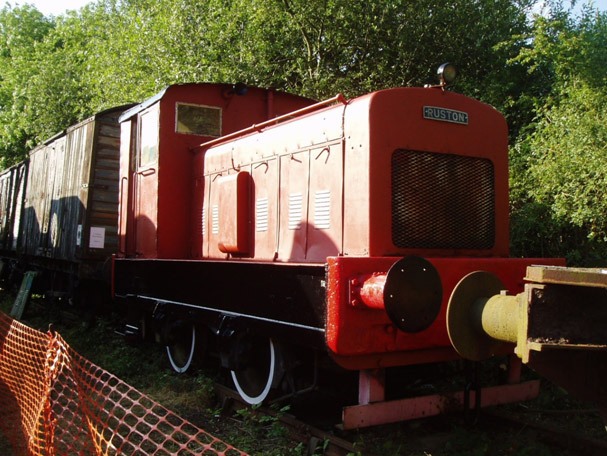 This is an example of the small but popular Ruston 88DS design which were turned out from the Lincoln Works in the 1940’s & 50’s to provide simple robust locomotives to smaller factories and operators. Started by an on board air compressor, the locomotives were produced from 1942 and at 88 horse power were enough to allow shunting of three or four wagons within a factory complex. This example was provided to British Electricity Authority Bidder Street Power station in Canning Town, London and remained there, save for a brief spell at Rye House Power Station in the Lea Valley until sold for preservation. It arrived at our Museum on 17th October 1981. The locomotive is of medium size and an interesting comparison with the contemporary 48DS and 165 designs also in the Museum collections.